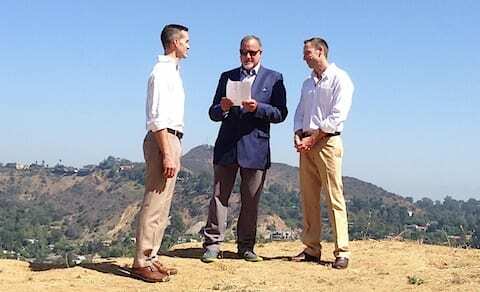 Congrats to Outsports founder Cyd Zeigler and his husband Dan Pinar who were married today in Los Angeles, at a wedding officiated by PR practitioner Howard Bragman. Writes photographer Jeff Sheng, who shot the photo above, on Facebook: "Congrats Cyd Zeigler and Dan Pinar on an amazing wedding in the hills above Hollywood. You brought everyone to tears. It was a joy to photograph…"